Sadly not. The fire is dim, the joints are stiff, and I’m back for Fringe number twelve. Technically I only did one night last year, though – does that count? I started off doing a uni revue (’07-’08), then migrated through the rough-and-tumble of sketch (’09-’12) into solo character comedy (’12 – Present). The last few shows have gone alright, but this year may well push me into the next phase: taiko drumming. I got married! That was wonderful, though I’m such a Fringe addict that I got married in Summerhall. You cannot keep me away. Also, they let me be in a sitcom called ‘Two Doors Down’, which was a dream. They gave me silly hair and a denim jacket so I knew I’d made it. It’s called ‘Kieran Hodgson: ’75’, the epic story of how we went into Europe in the 70s. History, politics and character comedy, somehow. I’m afraid to say that I’ve been a bit selfish and written it myself, so all the blame will fall on me if it goes badly. It’s produced by the rising stars of Fringe comedy, Berk’s Nest, who’ve been my producers and guiding lights for years now and whom I would thoroughly recommend to any budding comedians out there. They’re a bunch of people who just live for comedy and whose main concern is for your show to be as true to who you are as possible. With their help I’ve been previewing the show around the little theatres of London for months now, sometimes tweaking it but mostly tearing it apart and starting again. If I’ve gotten it right by the time we get to Edinburgh I’ll be very relieved, and then if people like it I’d love to take it on tour round the UK, and maybe even to Brussels to see what the unelected Eurocrats make of it. I think after they see my show they should go and see something silly and extravagant to get away from all my finickiness. I think Jayde Adams and Denim will be providing late-night glamour in that tasty post-Hodgson slot. 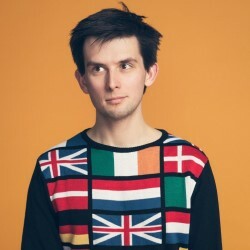 If you’re at the Fringe for more nights you should definitely see ‘Mr Swallow And The Vanishing Elephant’, as well as Sheeps, Emma Sidi, Tessa Coates and Rory O’Keeffe and YES THEY’RE ALL MY FRIENDS. If anyone has any interest in ‘further reading’ combining politics and comedy then there’s a play called ‘Brexit’ and it’s a bumper year for impressions, with Matt Forde, Jon Culshaw, Jan Ravens and Rory Bremner all up. But can they do a good Ted Heath?